128 Harley Street Dental Suite is rated 5 out of 5 based on 30 ratings with Google. Overbite is a dental condition in which the upper front teeth vertically overlap the lower front teeth. 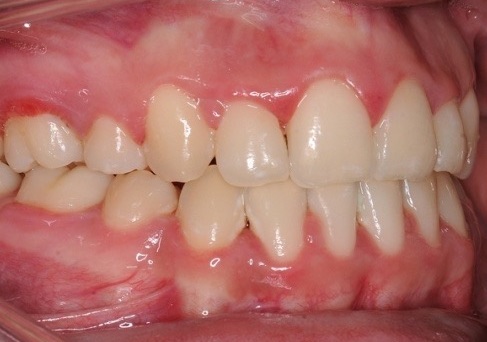 This is sometimes confused with Overjet where the latter is the protrusion of the front teeth over the lower. Overbite might not need correcting however an aesthetically pleasant smile would show both the upper and the lower teeth. What is the ideal Overbite? 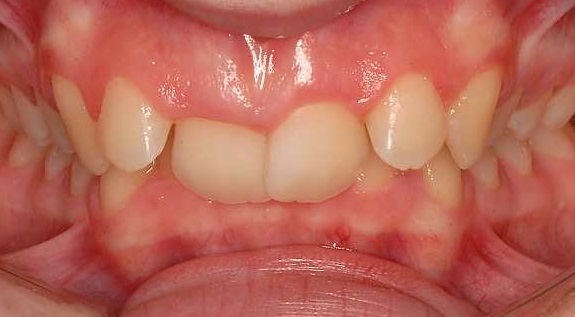 Overbite is often described as the percentage overlap of your upper front teeth over the bottom teeth; incisors. An ideal overbite ranges from 5-25%. It’s when the overbite is too little or too large that problems may arise. An excessive or increased overbite is also called a deep bite, and can cause unhealthy tooth wear, with loss of tooth substance, aesthetic concerns, and in some instances even jaw discomfort. 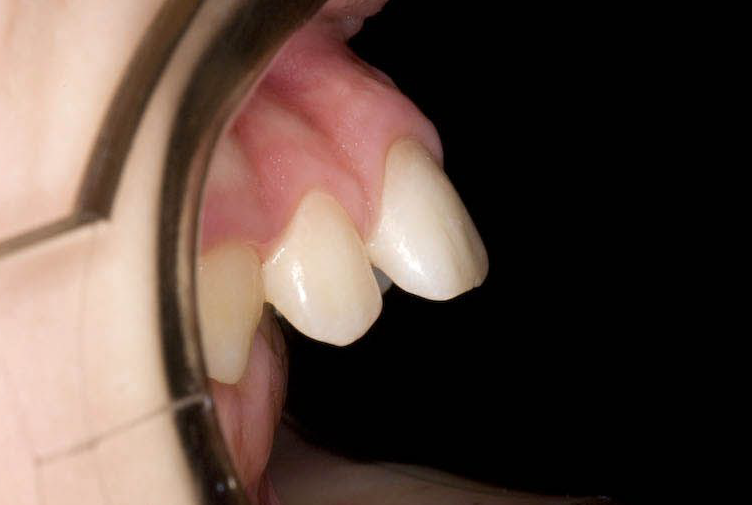 This overbite can be caused by thumb sucking which pushes the upper teeth forwards. Many cases of overbite can be successfully treated using most types of braces including orthodontic fixed appliances (on the outside of the teeth), Invisalign® or other type of clear aligners or braces on the inner aspect of the teeth; also known as lingual braces such as Win GmbH or Incognito™. Choosing an orthodontist that is experienced at using all types of braces to correct your smile is crucial to achieving the result you desire. Underbite refers to the dental condition in which the lower front teeth overlap the front top teeth. 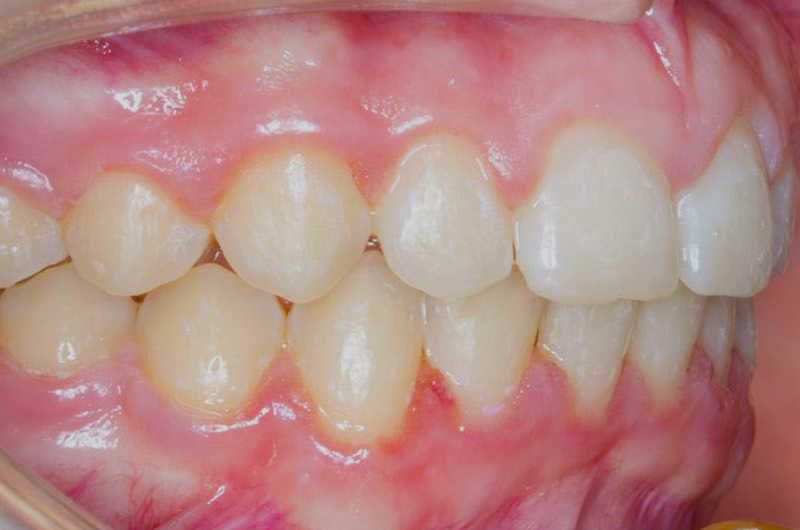 This condition might not need correcting however an aesthetically pleasant smile is one which presents with the upper front teeth overlapping the bottom teeth. In more severe cases an underbite can lead to a greater chin prominence and difficulties in eating, speaking and jaw discomfort or jaw pain and uneven teeth wear. What are the causes of Underbite? The underlying causes of an underbite include protrusion of the lower teeth or a discrepancy in size between the upper and lower jaws. Treatment options for an under bites usually include braces. Conventional fixed braces, ceramic braces (tooth-coloured) or with more discreet appliances such as Invisalign® or other type of clear aligners or braces on the inner aspect of the teeth; also known as lingual braces such as Win GmbH or Incognito™. In the case of conventional braces, the orthodontist will review the progress of treatment every 6 to 8 weeks and the braces are adjusted accordingly. Elastic bands might be applied to correct your bite quicker whilst the braces will simultaneously straighten your teeth. The clear aligners as well as the braces placed on the inside of the teeth are custom made. The clear aligner are usually changed every 2 weeks whilst the braces on the inside (lingual braces) are adjusted every 6 to 8 weeks similar to conventional braces. Your specialist orthodontist may recommend the use of elastic bands at the start of treatment and these are usually placed on the side of the braces. 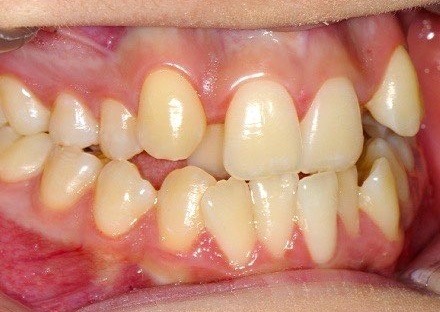 Underbites might be an issue to many patients however most braces can manage this type of bite problem. Your specialist orthodontist will want to make sure that your underbite is corrected and you achieve the smile you always wanted. Stefan is a Consultant in Orthodontics at one of the most prestigious London teaching hospitals; Guy’s and St Thomas NHS Foundation Trust. 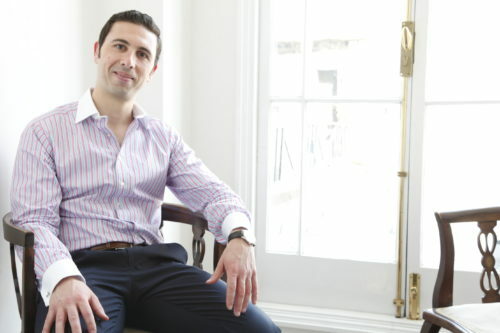 Stefan is also a specialist in Orthodontics and is registered on the General Dental Council (GDC) specialist list.